This giant baked German pancake is amazing! Puffy golden-brown and delicious, hot from the oven – that’s a perfect breakfast you’ve been waiting for! I love the idea of baked pancakes! You get delicious pancakes and you don’t have to slave standing over the stove to make them! This German baked pancake is the laziest way to make pancakes ever! You just mix the pancake batter in a bowl, pour into a baking dish and bake in the oven for 20 minutes. When amazing golden-brown puffy baked pancake comes out of the oven, all you need to do is slice it into squares for multiple pancakes. Whoever invented the baked pancake concept is a genius! 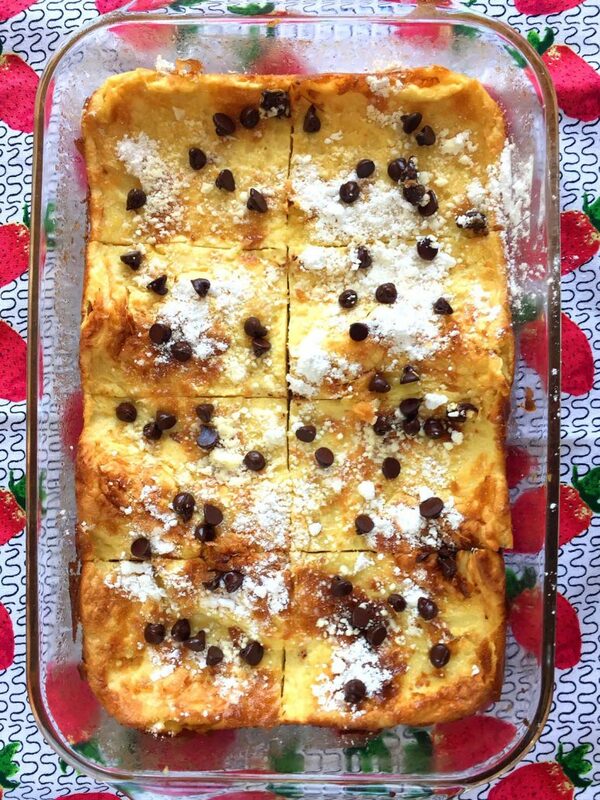 This amazing German baked pancake recipe uses the simplest ingredients: eggs, milk, flour, butter and sugar. Chances are you already have this stuff in your pantry and fridge! I also like to add vanilla, but if you don’t have it feel free to omit 🙂 For sprinkling on top, I use powdered sugar, but if all you have is regular granulated sugar, that will work too! These oven pancakes are so budget-friendly, as all the ingredients are simple and cheap! You can double the recipe and bake it in two dishes on two oven racks at the same time and feed a crowd! When the baked pancake comes out of the oven so puffy and yummy looking, everyone will drool! 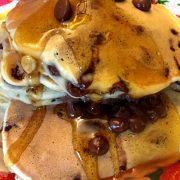 And when you sprinkle it with powdered sugar and toppings, it just looks super impressive, like the breakfast of kings! 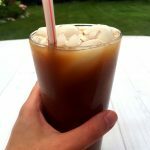 It’s so hard to believe how easy it is to make! You can really be creative with the topping for these German oven pancakes. 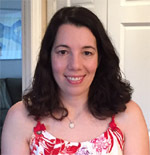 On this picture I used chocolate chips, I also like to use fresh berries for topping – sliced strawberries are awesome! 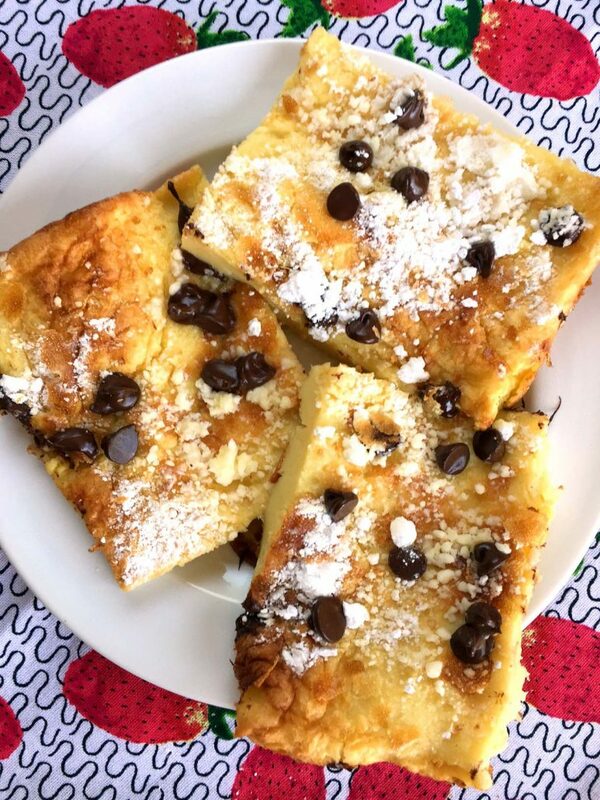 No toppings – no problem 🙂 This amazing puffy delicious baked pancake is delicious with or without the toppings – eat it any way you like! 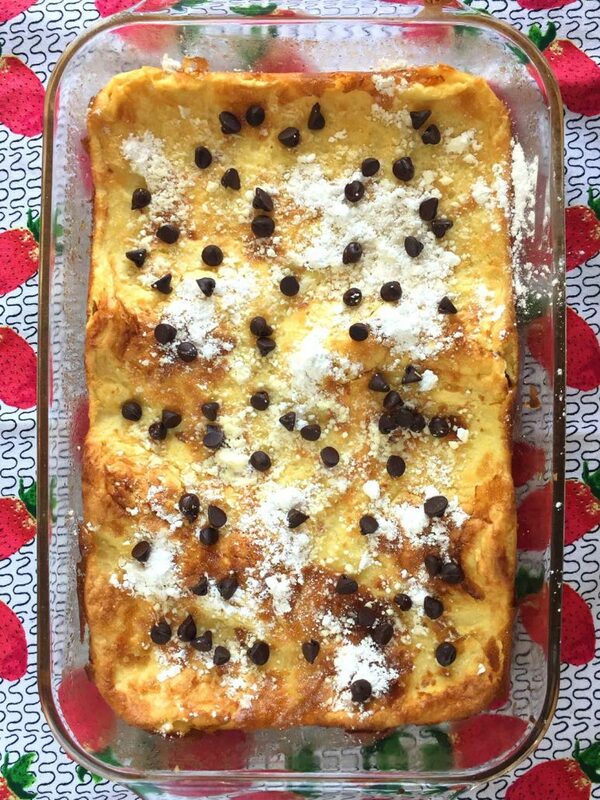 German baked pancake is very filling – much more filling than regular pancakes. It’s so filling because if uses more eggs than traditional pancakes, therefore it has more protein! Pancakes that make you full without bacon or sausage – that’s almost too good to be true! Filling and delicious breakfast – I am in! Giant oven baked German pancake - YES, YES, YES! This puffy golden-brown baked pancake is amazing! Super easy to make with simple ingredients from your pantry and so mouthwatering! Pour melted butter on the bottom of 9x13 inch non-stick baking dish, making sure to distribute it evenly all over the bottom of the dish. Put eggs, milk, salt and vanilla in a bowl and mix until combined. Add the flour and mix until combined. Pour the mixture in the baking dish. Put the baking dish in the oven and bake for 20 minutes. Remove the German pancake from the oven and sprinkle with powdered sugar. Add the chocolate chips on top (if using). 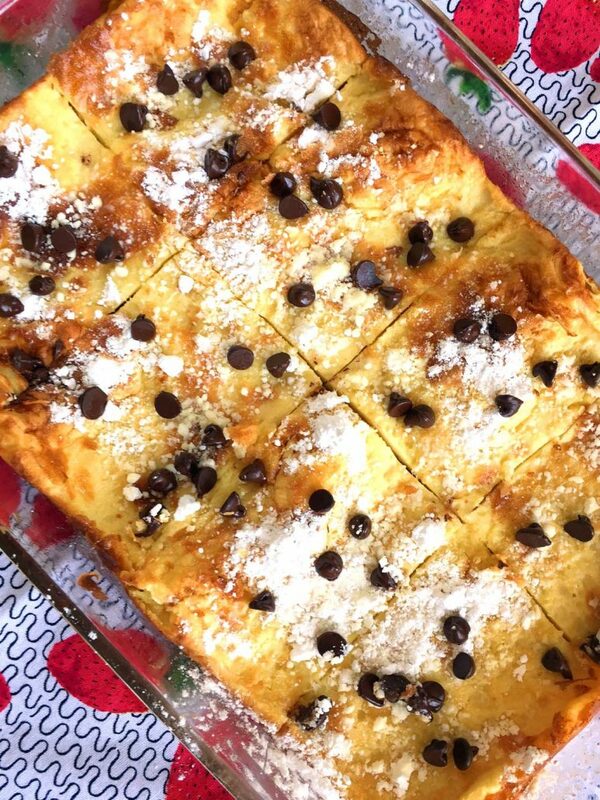 Cut the German pancake into squares and serve immediately. 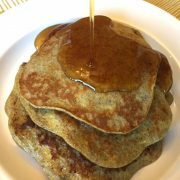 Healthy 3-Ingredient Banana Pancakes - Gluten-Free Clean Eating Recipe! 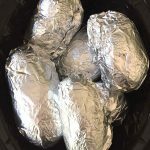 Crockpot Baked Potatoes Recipe – Easy Slow Cooker Potatoes In Foil!